“Billy” Eduard Albert Meier was born on February 3, 1937, in Bülach/Zurich, Switzerland. 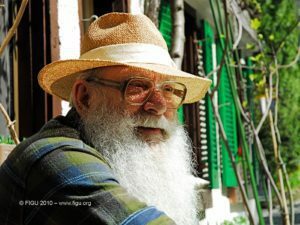 NOTE: In addition to being the only scientifically proven UFO contactee, Billy Meier is the source of the most abundant, specific prophetically accurate scientific and world event related information. There are now well over 200 prophecies and predictions from Meier that have been corroborated. He had his first extraterrestrial contacts at the age of five with Sfath who was from from Erra (Pleiades/Plejaren), from 1942 to 1953. From 1953 to 1964 his contacts were with Asket from a sister universe to our own called the DAL universe. Then from 1975 to 1986 his contacts were with Semjase and Ptaah and Quetzal. The Pleiadians/Plejarens and their confederates are human beings with physical bodies and look very much like the people on Earth, with the exception of some minor anatomical differences, especially regarding the confederates. They live for 1,000 years, approximately. Their home planet — somewhat smaller than Earth — is called Erra. Its population is about 500 million people, while the entire federation has a population of 120 billion. The Pleiades / Plejaren are not identical with the Pleiades we can see on the night sky. They are 80 light-years beyond the Pleiades in another space-time configuration (another dimension). The Pleiadian/Plejarens’ consciousness (“spirit”) and technology are much more highly developed than here on Earth. The Pleiadians/Plejarens and the people on Earth have the same ancestors, but have developed separately. From 1975 until August 19, 2003, there have been 632 personal and 748 telepathic contacts with Pleiadian/Plejaran extraterrestrials and members of their Federation. The contacts are still on-going. More then 347 contacts have been documented and available as contact reports. As of 2003, 16 volumes of Contact Notes, each consists of 200 pages, are available (German only) Some of the subject matters discussed are: Creation and its creations, origin of the universe, earth history, science, astronomy, spirituality, reincarnation, genetic engineering, terrestrial religions, human evolution, spiritual teachings, interplanetary space flight, galactic federation, extraterrestrial origin and visitation to Earth, telepathy, overpopulation on Earth, destruction of the environment, male-female relationships, government and military cover-ups, and many more. Hundreds of photos taken of beamships and their landing tracks, among other things Photographs of 5 different variations of spacecraft, from 3.5 to 7 meter, usually piloted by humans. Other spacecraft and telemeter discs are remotely controlled and have also been photographed on several occasions. There also exist huge spaceships for traveling through space. There are photographs of single or multiple objects, day and night settings, above and below horizon line. There exist video and super 8 footage. Film analyzed by electron microscope, laser scanning and computer functions, thermogram edge identification, Z scale contour, density and film grain inspection, processed by electron microscope,microdensitometer, infraredometer, vidicon tube, digitizer, image process computer equipment. The films show variations in flight of ships; multiple craft appearances; instantaneous spatial translations by space craft; portions of the films have been analyzed in frame by frame format. Metal analysis was described thoroughly in video tape format (Beamship the Metal). It showed that the metal was made by a cold fusion process. This technology is not yet known by terrestrial metallurgy. The sound recordings of a non-shielded beamship was taken in the presence of several witnesses who heard the deafening noise, but weren’t able to observe the ship that was screened from sight. The loud whirring sound could be heard for more than 4 kilometers as was confirmed by persons who soon arrived at the location. The scientific investigation showed that the sound is comprised of many tones/frequencies with unusual anomalies and rapid changes in tone and frequencies. Download the Beamship sound! Depending on the type of beamship there could be seen 1 or 3 landing tracks. When three, they were 120 degrees apart, circular; grass was depressed in counterclockwise rotational direction, visible for months after landing occurred. Both existing and new grass were affected. In addition to “Billy” Meier there are more than 70 people who have witnessed the evidence regarding the Pleiadians / Plejarens, their beamships, or Billy himself.